Credit services are loans to MSMEs or individuals, often giving capital to those who could not get loans from commercial banks. 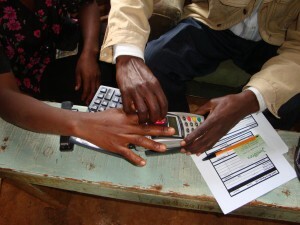 The microcredit and Peer-to-Peer sectors are two of the fastest growing areas of Alternative Finance. A Kenyan loan officer is receiving payment from a microfinance client, using biometrics as her identification. Some of the first Alternative Finance institutions were in microcredit, targeting the poor members of the community and providing loans and financial education. For example, Grameen Bank, started by Muhammed Yunus in Bangladesh, pioneered microcredit by extending banking services to the poor, especially women, reducing the exploitation of these people by moneylenders, and helping to break the cycle of poverty with the infusion of credit. Peer-to-Peer lending connects a business’s needs with individuals willing to invest. There are different channels for these investments, such as P2P credit, P2P equity or P2P factoring. These channels are especially prevalent in emerging markets, such as China, where MSME financing from banks is almost non-existent. P2P credit: By cutting costs associated with big banks, individuals can lend their money and receive higher interest payments, while borrowers can get cheaper loans and have more personal support in their repayment. Zopa, a UK-based P2P credit firm, is a good example. They enable savers and borrowers to make direct loan contracts, make sure that borrowers can afford their loans, and are transparent in their low yearly fees charged for services. P2P equity: Also known as crowdfunding, is a platform for borrowers to pitch to investors, offering a return from the venture in exchange. Crowdcube, a UK based equity crowdfunding website, allows entrepreneurs to raise smaller amounts of money from more investors who can be a part of the company’s success. P2P factoring: Small businesses often need the money from products or services they have invoiced to larger companies before they pay them (usually a wait of 60-90 days) so short-term P2P credit on unpaid invoices has developed. MarketInvoice offers these services in the UK, allowing businesses to receive cash from outstanding invoices within 48 hours for a small fee upon collection of the invoice payment.